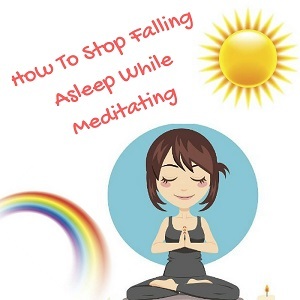 One of the biggest questions I get asked is how to stop falling asleep while meditating. I have had this happen many times when meditating and have so great tips on what I did to help stay awake. The first step is to not beat yourself up for falling asleep. It’s actually quite normal to fall asleep when you’re learning to meditate. Even people who have been meditating for years can still find themselves nodding off for a few moments depending on when and how long they meditate for. Then there are those times when you might feel a jolt in your body as you drift in and out of consciousness and the jolt is what snaps you back to alertness. This often means that you have been meditating deeply and were not aware of it. It’s the minds way of saying that it is not yet ready to stay awake while in such a deep meditative state. Here are a few more tips to help with staying awake. The body is made up of electricity and it’s the smooth flow of that electricity through the body and brain that helps you to not only meditate deeply but also to stay awake. If you are dehydrated then this makes your body work harder to generate energy which is why you can feel tired and fall asleep easier. Keep a water bottle with you while meditating and if you start to nod off then have a drink. Try not to sit in a lounge chair or lay down while meditating as that sends signals to the brain and body that it’s okay to fall asleep. By keeping your spine and neck straight it helps prevent your brain getting the idea that its nap time. If it helps, try adjusting your posture every few minutes to help with alertness. Sitting on a cushion on the floor with your bottom slightly elevated and your legs crossed helps with keeping the spine erect. 3. Try a Moving Meditation. Not all meditations need to be done sitting down. You can do a walking meditation in which the focus is on your feet rising and falling as they touch the ground. Another form of walking meditation is where you focus on walking slowly and gazing at the ground directly in front of your feet. The purpose is to keep your focus just in front of you and not let yourself be distracted by what’s going on around you. Do either of these for 5 or 10 minutes. Most of all, don’t judge yourself if you do fall asleep. You can always try meditating for shorter periods at first so that your mind and body eases into the practice. I’d also recommend meditating first thing in the morning as your energy will naturally be waking up to match the energy of the day. Over time, you’ll find what works best for you and who knows, one day you may even need to meditate to fall asleep.